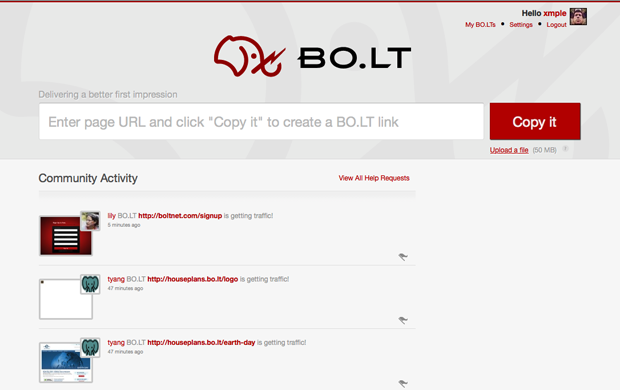 With $5 million in funding from Benchmark Capital, webpage sharing service Bo.lt launches today after about a year in private beta. Like a “Bit.ly on steroids,” the service lets you paste any URL into its copy engine or bookmarklet, creating a duplicate of the page on its servers. 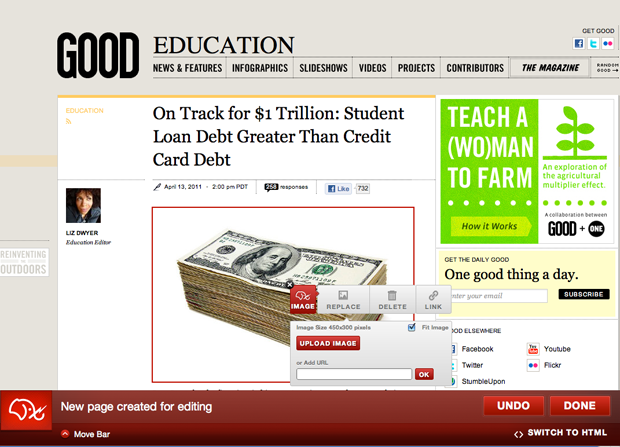 Once copied, Bo.lt lets you quickly edit the page itself. You can change the text, edit and delete images and text and change links — either through the Bo.lt visual editor or its HTML editor. You can then share the page on Twitter or Facebook through its customizable URL and let other people edit or make changes which are tracked. The page editor tool itself is extremely intuitive to use, and is pretty fun if you’re creatively messing around with web pages and pretty useful if you’re trying to complete actual work like A/B testing site code changes or codelessly trying out different headlines, images and fonts on a content page. Bo.lt serves up realtime analytics on each page, showing you the amount of traffic from Twitter, Facebook and Google as well as providing more webmaster-friendly data like differences in page load time. The service also lets you see all user Bo.lting activity in a Community feed, and lets you explore other users’ activity visually when you click on their profile page. As with any content aggregation service, there’s always the looming specter of copyright issues, but co-founder Matthew Roche tells me that the tool is content provider friendly in that Bo.lt still serves up a given page’s ads and analytics systems. “It’s way of preserving the form and visibility of the content while increasing the reach,” he says. As a tool enabling sharable webpage changes like this has never existed before, it remains to be seen exactly how content owners will react to their content being altered and shared in this way. Bo.lt plans on monetizing through premium accounts that give users the ability to create Bo.lt pages under their own domain names as well as other power user features like suppression of the automatic share to the Community feed. 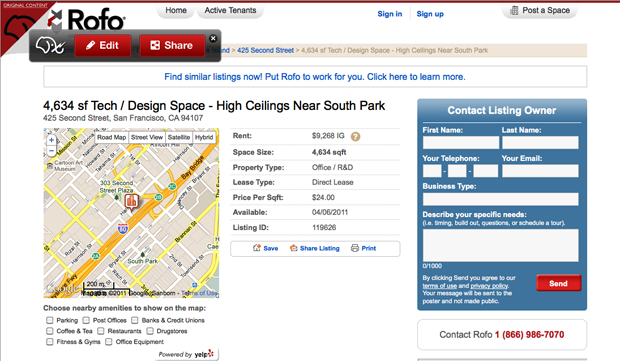 Right now partners like Houseplans.com, Second Porch and Smart Destinations are all using Bo.lt to target web pages to customers. The service begins rolling out to early signups at 8am PST today, and a hundred interested TechCrunch readers can get priority access here.